Last weekend we decided to take a break from the desert heat, and head up the hill to the mountain community of Idyllwild. 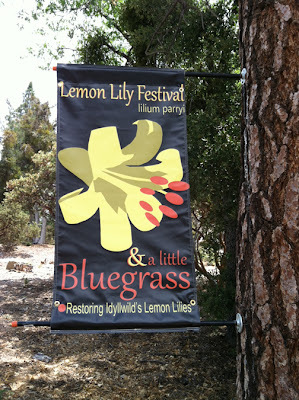 We also wanted to stop by the Lemon Lily Festival while we were in town. 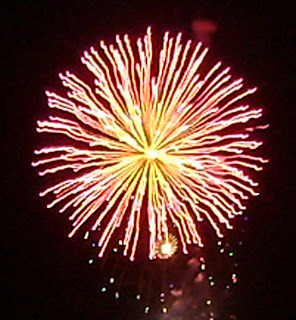 The Festival is held to promote awareness of the Lemon Lily, with the goal of educating the public about its status and restoring the plant to its former habitats. The Lemon Lily (Lilium paryii) is a fragrant and showy wildflower that grows in moist, shady habitats such as springs, bogs and canyon bottoms. It can reach an impressive height of up to 5 feet, with multiple blooms at the end of the tall stalk. 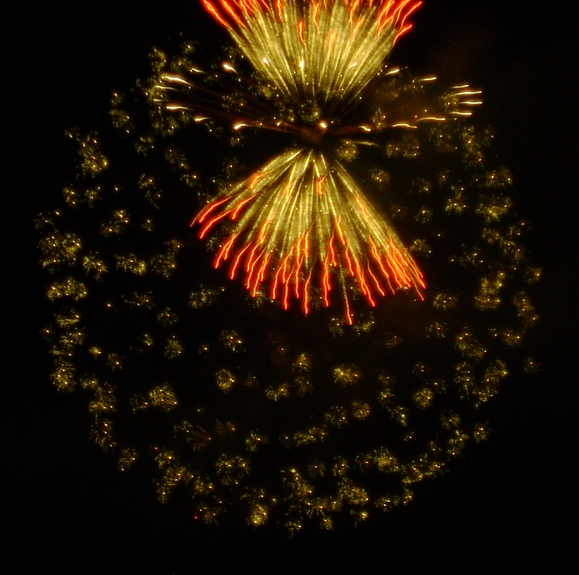 Lemon Lily was much more widespread than it is today. One hundred years ago the Lily was already disappearing from its natural habitats due to over-collecting of the bulbs and plants. Today it is found mainly in the most remote areas of its historic range. Although it is not endangered, it is considered a sensitive species. 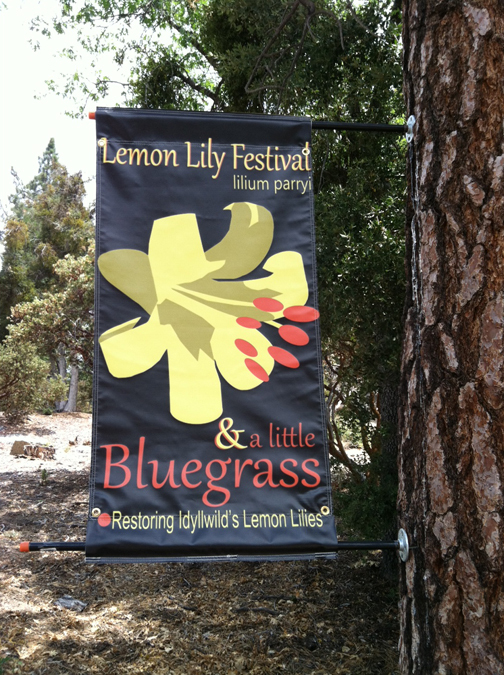 The Lemon Lily Festival featured guided nature walks, a native plant sale, live music and plenty of food. Local restaurants offered specially themed items on their menus, and an art fair featured area artists selling their handcrafted items. We took a relaxing hike on the trails around the Idyllwild Nature Center. Really refreshing to enjoy the pines and oak trees, white puffy clouds, and the cooling breezes. 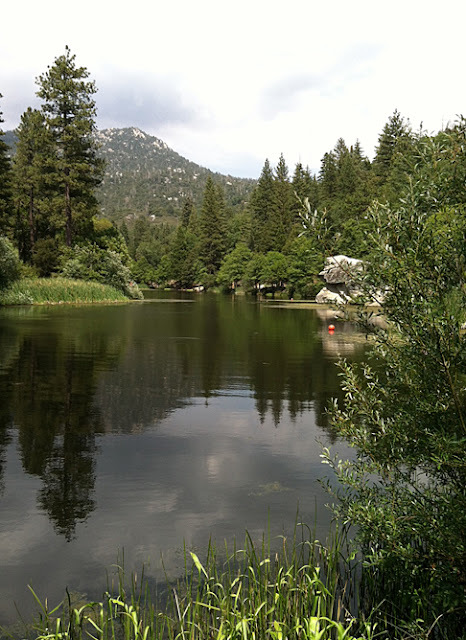 After leaving the Idyllwild Nature Center, we made a stop at Lake Fulmor. - just a few miles further down the highway. The lake was pretty busy, with families picnicking, BBQ-ing, fishing and enjoying the beautiful day outside. The lake is stocked with bluegill, large mouth bass and rainbow trout. Mornings have been relatively cool lately (in the low 80's), so we've been working in the yard before it gets too hot and humid. Occasionally, we find Praying Mantises. This one was living in a clump of dried up wildflowers in the courtyard. S/he is about 2 inches long, and a pale green color. 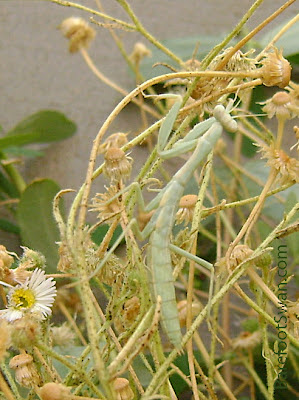 Praying Mantis is a highly voracious and efficient predator. They eat crickets, flies, spiders and (depending on the size of the mantis) smaller lizards, rodents and birds. 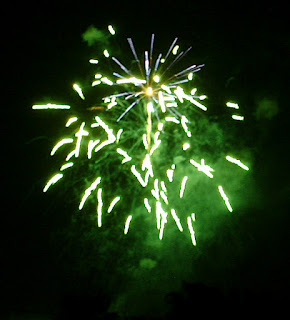 They can sit still for hours on end, gently swaying to mimic the motion of a leaf or branch in a breeze. They will also patiently stalk their prey. When the unsuspecting victim is within reach, the praying mantis will grab it with its forearms in a lightning-fast strike. The prey is devoured alive. A sharp, cutting mouth tears through the tough exoskeleton of insect prey. Spikes on the forearms help the mantis keep hold of its victim. Praying mantises have excellent binocular vision, and can turn their head from side to side - up to 300º range of motion in some species. 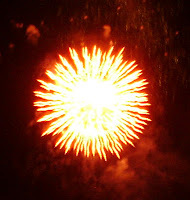 They are primarily diurnal. The mantis life cycle has three stages: egg, nymph and adult. Mating season is typically in autumn. 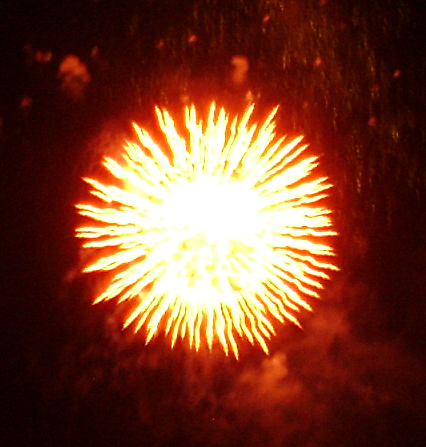 The male is sometimes consumed by the female after mating. 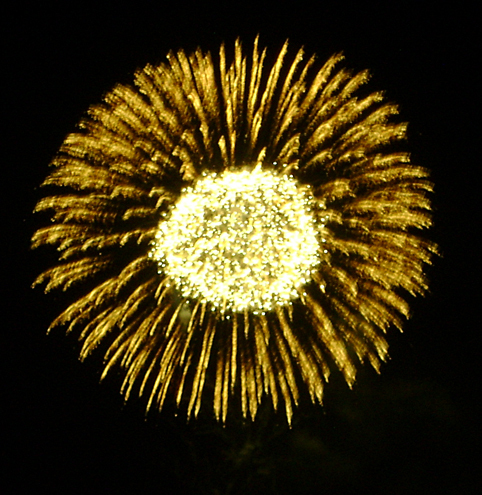 Eggs are laid in a frothy mass that hardens into a protective case, or ootheca. Egg capsules that survive the winter will hatch in late spring or early summer. The hatchling nymphs are ravenous and feed on fruit flies, aphids - or each other if sufficient food is not available. 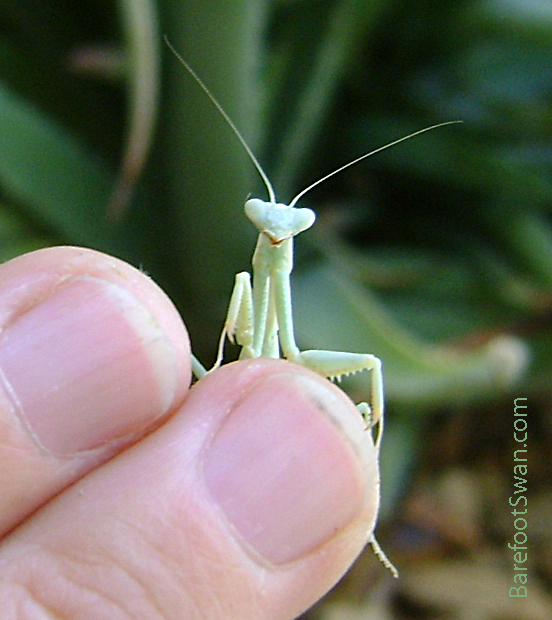 The mantis nymph will grow and molt a number of times before reaching adult size and beginning the cycle again. Praying mantises only live for about a year. 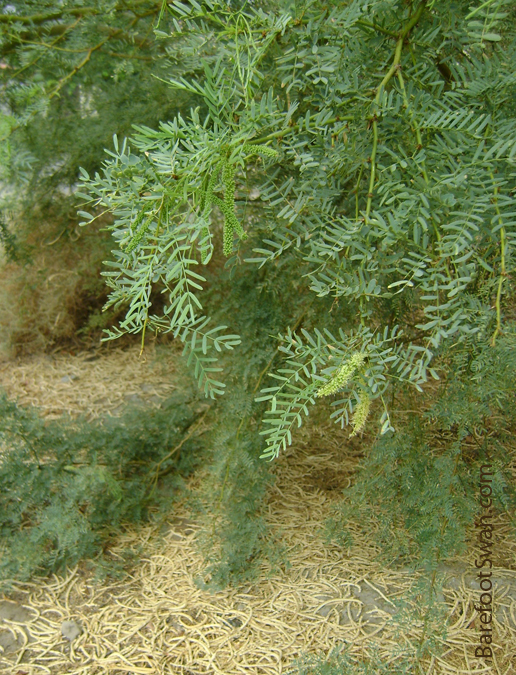 Many garden supply stores sell mantis egg cases for biological pest control. 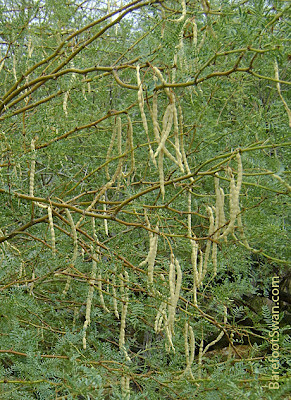 Or you can watch in your yard for the egg cases that have been laid on the underside of twigs and leaves. 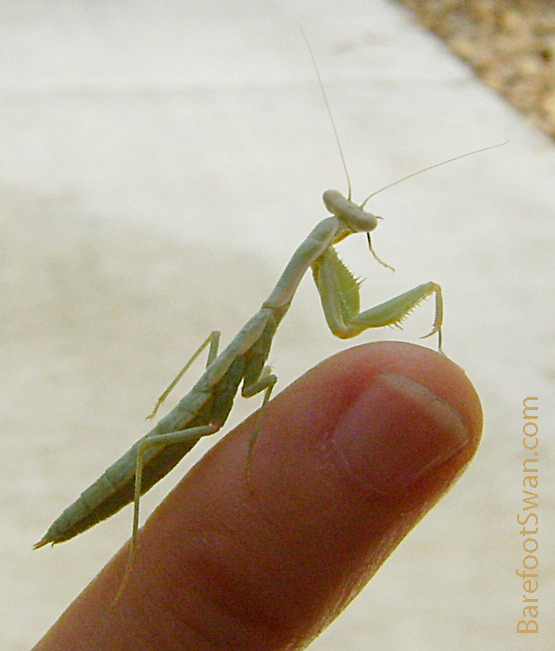 After our photo session, I moved the mantis to another part of the yard where s/he is less likely to be disturbed. This year we had quite a few volunteer sunflower plants appear in our yard. These grew on their own, from seeds that dropped from last year's plants. The tallest plant was this one - over 11 feet high. It has more than 100 flowers and buds. 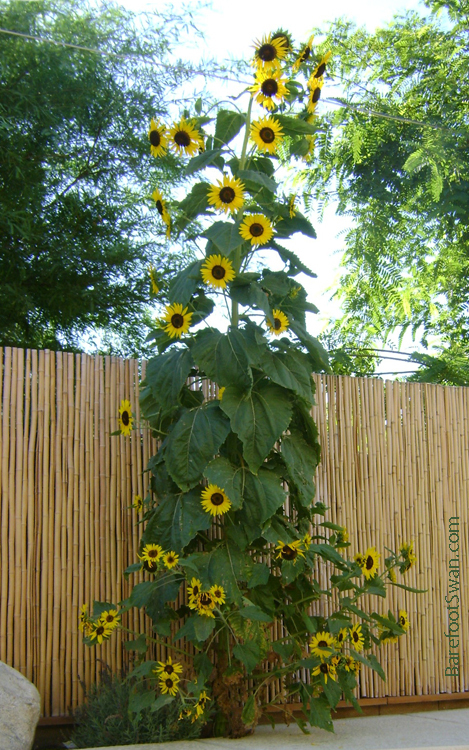 We had other volunteer sunflowers, but they didn't grow nearly as tall as this one. Two of the other sunflowers grew to about 7 feet high. 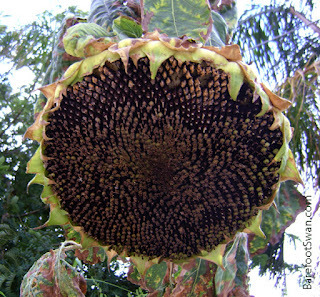 They each had a single ginormous seed head, measuring over 10" across - larger than a dinner plate. 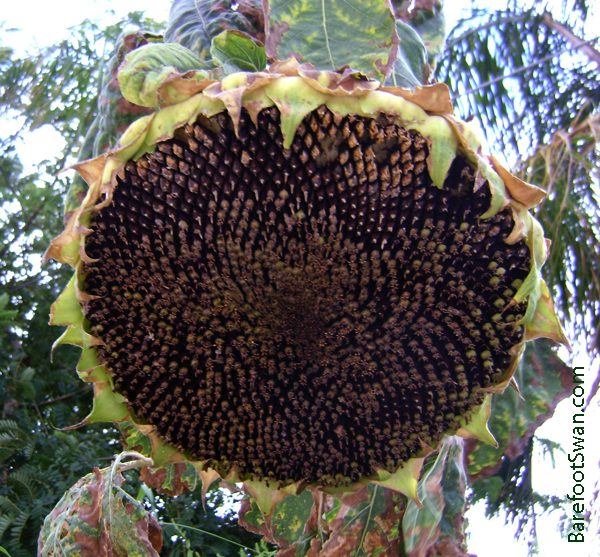 The other smaller sunflower plants are drying and setting seeds, too. 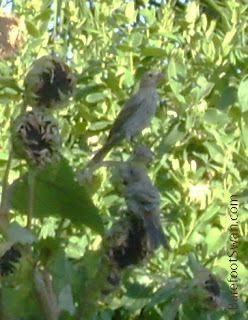 House Finches and Lesser Goldfinches have been feasting for a couple of weeks now. We have had over 20 birds on the sunflowers at one time. 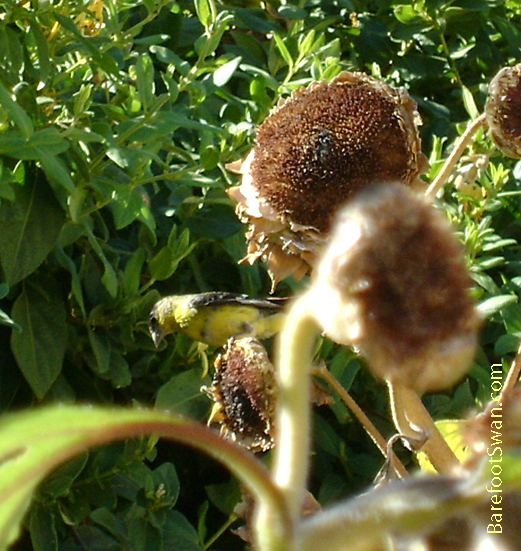 The Lesser Goldfinches are still nibbling the sunflower leaves (below). Planting sunflowers is an easy way to feed birds. 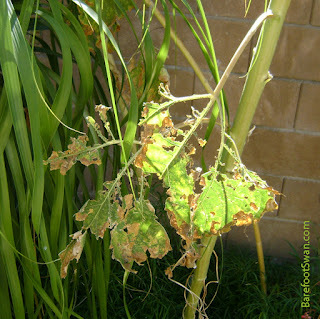 -- Multiple seed heads minimize squabbling and "bully birds"
-- Best of all - inexpensive or FREE! 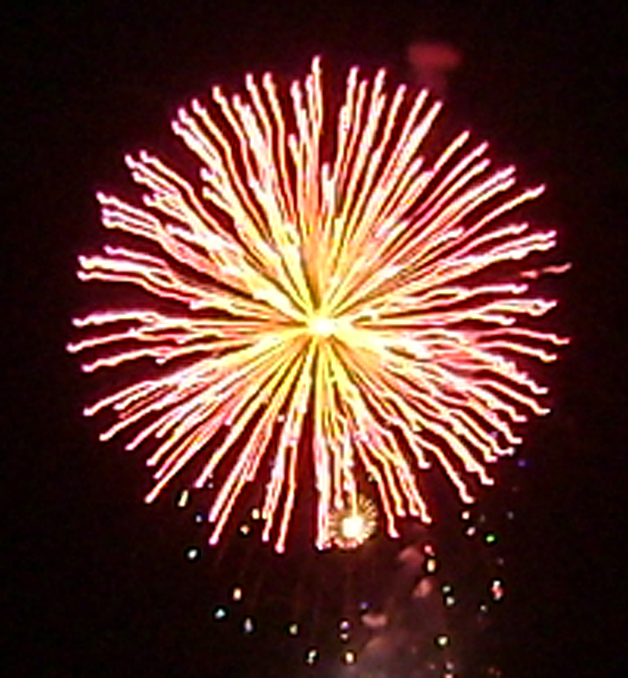 After 2 days of 114º highs, the temperature hit 119º yesterday. That was the official high in Palm Springs. This was at 5pm, driving home from work. Amazingly, we were not the hottest spot in the country. 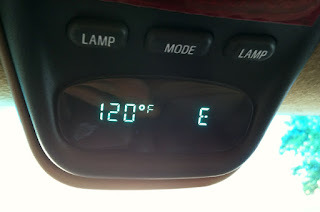 That honor went to Death Valley, at 126º. Possible rain and thunderstorms in our forecast for the next couple of days. We're going from High Heat Warnings to Flash Flood Watch. 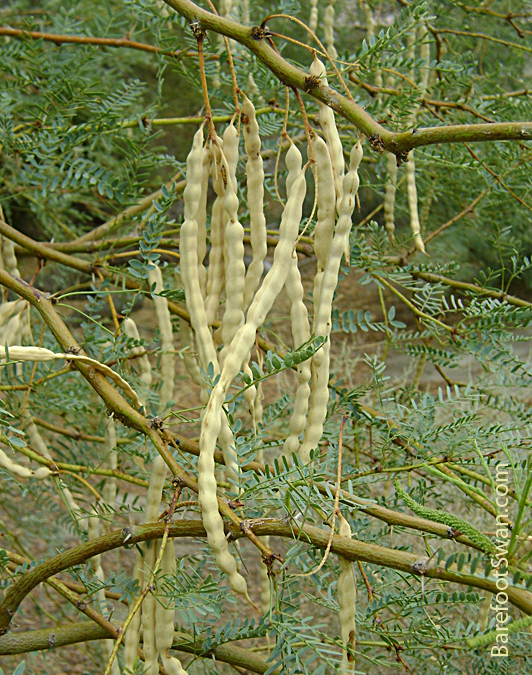 The bean pods on our mesquite trees have ripened, turning from a bright lime green to a lovely pale honey color. 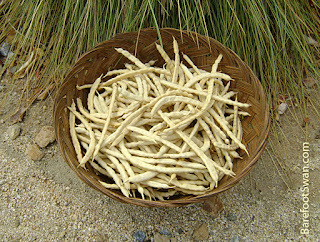 These pods can be ground into a sweet and nutritious flour. 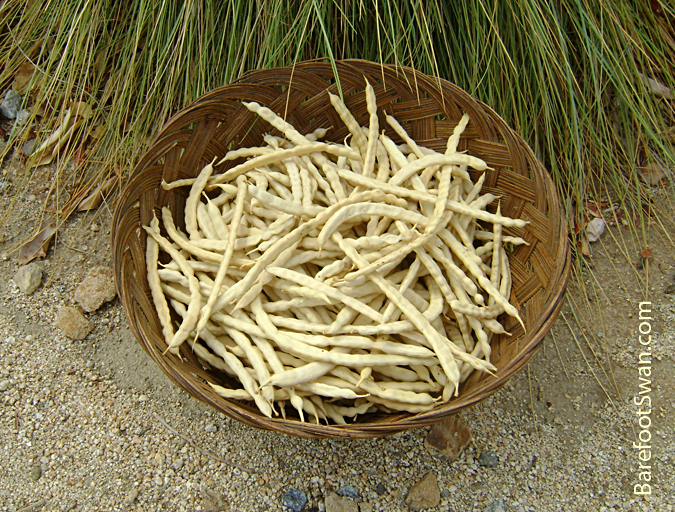 The flour from the pods contains 20-30% sugars, while the seeds are 35% protein. 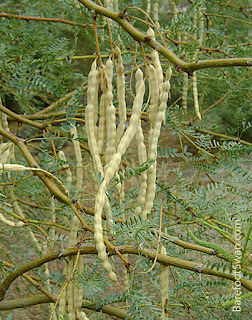 Mesquite was a major food source for the local Cahuilla Indians. They ground the pods into flour using stone mortars and pestles. We use a blender to grind the pods into flour, but the dark seeds inside are too hard to be affected even by the sharp blades. 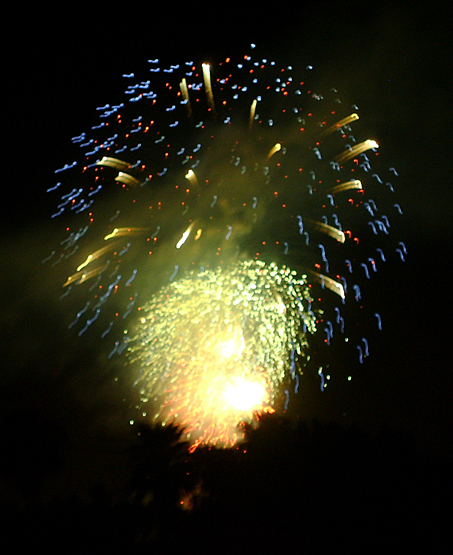 There was rain on the morning of the 4th, so we'll wait a couple of days before grinding. Otherwise, the lingering humidity will make the flour sticky. While gathering the pods I noticed that second round of flowers is already in bloom on the trees. 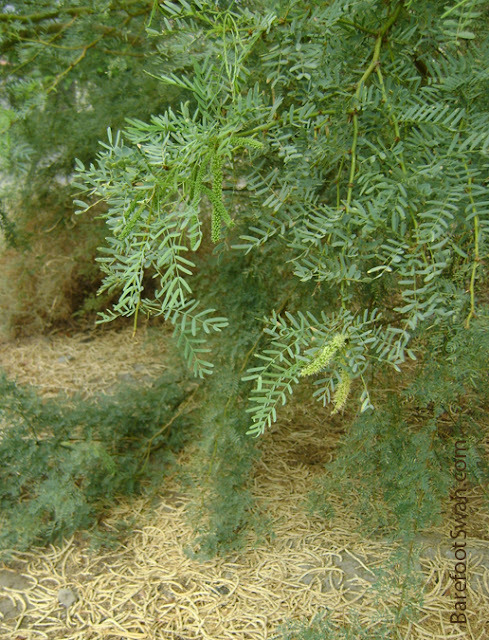 The picture below also shows the carpet of mesquite pods on the ground below the trees. 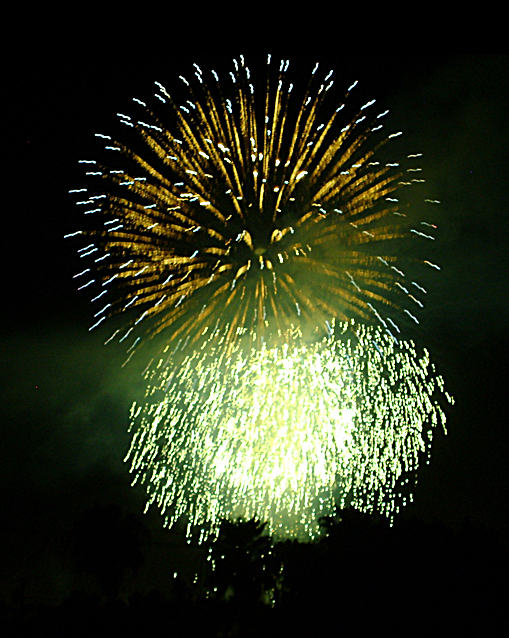 Our nation is 236 years old today. 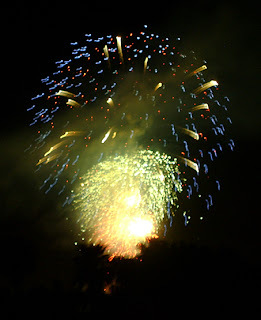 Some pics of the local fireworks show. 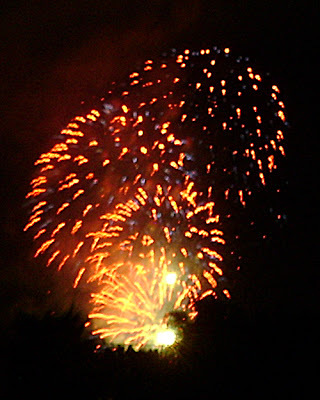 Photos were shot from the roof of our house, using our digital point & shoot camera on a tripod. 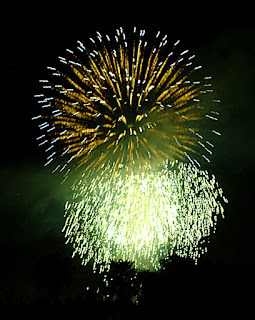 that among these are Life, Liberty and the pursuit of Happiness."